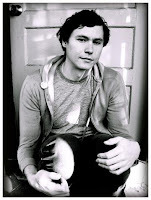 I've been trying to not like Jacob Golden because I liked his music the moment I heard it. Does what I just said make any sense? Ever get that feeling if you like a song instantly, there's a good chance you're going to grow sick of it really soon? I get that a lot with this music stuff, it makes me feel vulnerable to saying stupid things like "I like Vampire Weekend". 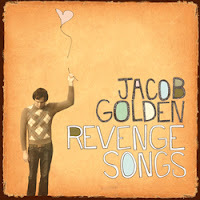 So Jacob Golden entered my life a week ago in the form of this video Out Come The Wolves from his album Revenge Songs. Since then I've been trying to shake the urge to hear him again and I simply can't! The other tracks on Revenge Songs are equally atmospheric, I feel like he's in my living room singing to me, it's personal. I like the way he sings in accent, almost a little Michael Stipe-esk in that respect but easier on the ear mixed with some Simon and Garfunkel flavour. The sudden bursts of racing energy injected into his songs provided by just an acoustic guitar and vocals (no drums) and a great big dollop of Californian sunshine. Hope you haven't lost me in that description. What I'm trying to say but tripping over my tongue in doing so is go out and buy this album! It's truly lovely and haunting and deserves to be heard. I can't wait to catch this guy when he comes over to the UK next. For more information about Jacob Golden try myspace and his website.